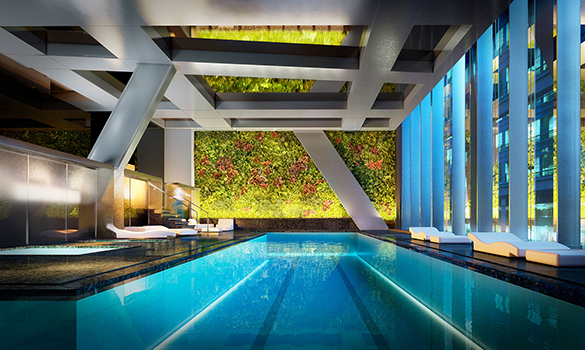 Regarded as the most architecturally significant addition to the New York skyline in recent years, 53 West 53 is a feat of ingenuity and brilliance designed by Pritzker Prize-winning architect Jean Nouvel. 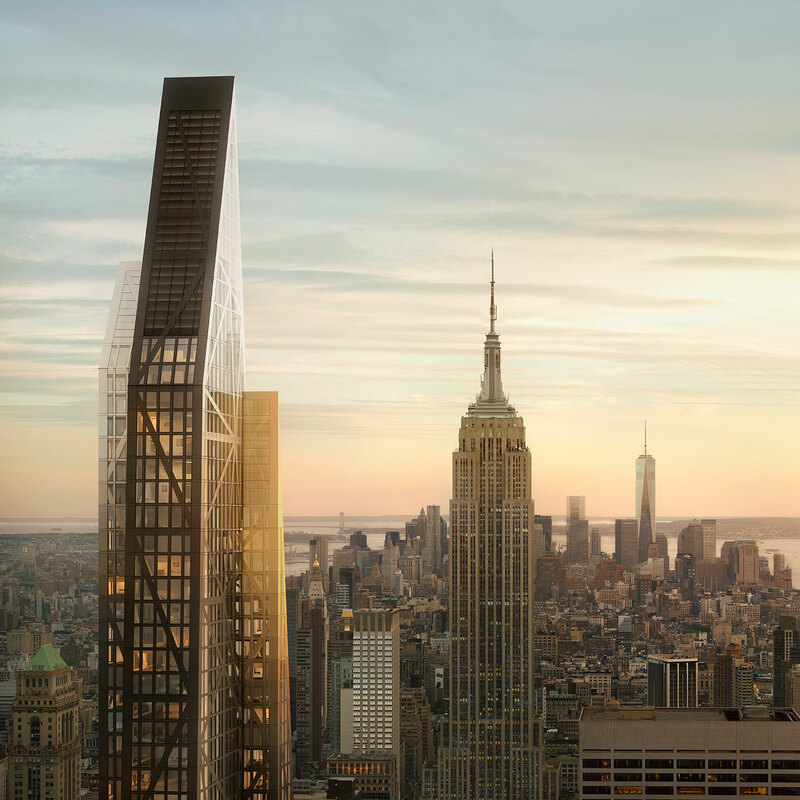 The elegantly tapered tower soars to a height of 1,050 feet, offering breathtaking views of Central Park, the expanse of Manhattan, and the Hudson River from its 145 one- to four-bedroom residences. 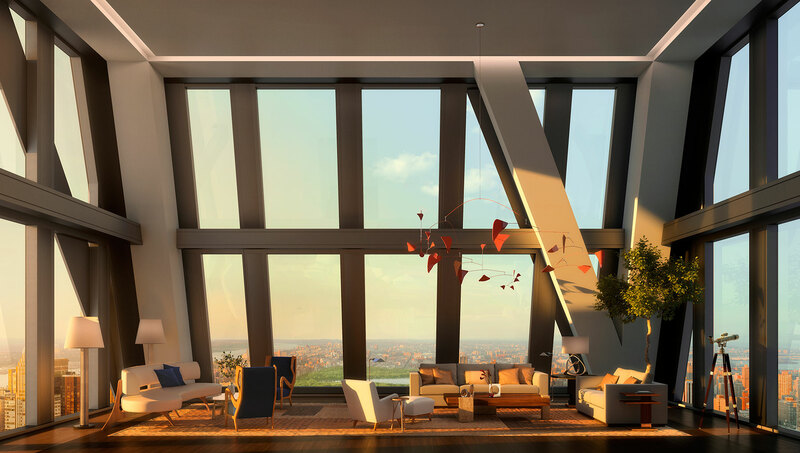 An exposed structural diagrid system on the building’s exterior allows for unobstructed interior expanses while floor-to-ceiling windows strikingly frame the views. Celebrated interior architect Thierry Despont approached his design of the residences as he would a private commission; impeccable quality is apparent throughout in details like furniture-grade mahogany doors throughout complemented by the architect’s custom-designed E.R. Butler & Co. bronze hardware inspired by the tower’s distinctive silhouette. 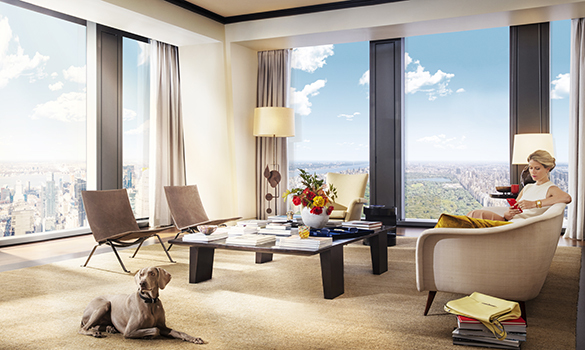 Residences feature custom tray and cove ceilings ranging from ten to eleven feet, wide plank American oak floors, and high performance windows. Kitchens are outfitted with custom Thierry Despont for Molteni back-painted glass cabinetry with polished nickel detailing, polished Statuary marble countertops and islands and fully-integrated appliances by Sub-Zero and Miele. Master baths offer a dramatic mix of high design and tranquility with Verona limestone floors and baseboards and a Noir St. Laurent marble feature wall. 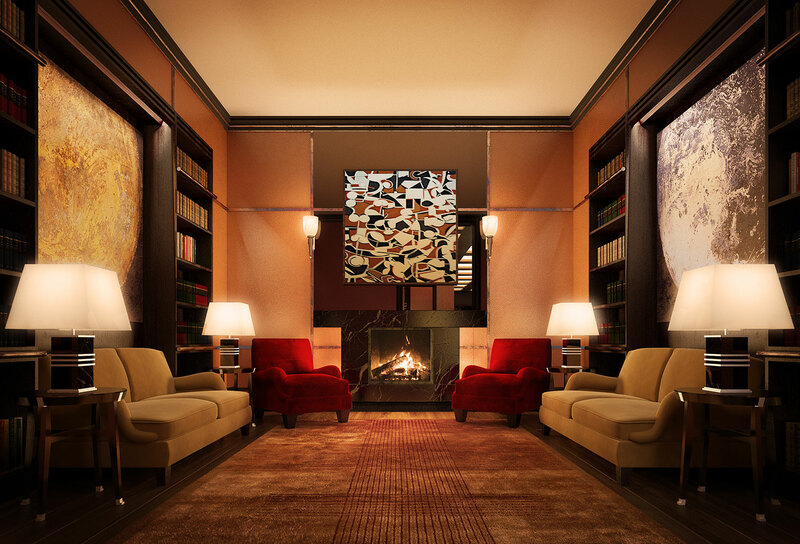 The evocative full-service lobby designed by Thierry Despont features a welcoming library seating area, oak wall paneling with bronze trim, coffered ceilings, and a custom-designed fireplace. Additional building amenities include a private state-of-the-art theater, a 46th floor lounge with Central Park views, a private formal dining room, a wine tasting room with vaults, and a 15,000 square foot wellness center with lap pool, whirlpool, and cold plunge with an elaborate poolside vertical garden designed by noted French botanist Patrick Blanc. 53 West 53 has the unique distinction of being integrated into The Museum of Modern Art’s campus. Three new gallery levels will be created within the base of 53 West 53, each accessed from and connected with the museum’s existing exhibition spaces. Residents will receive deeded W53 benefactor memberships at MoMA, including the opportunity to host private events in the museum’s iconic Sculpture Garden. The complete offering terms are in an offering plan available from the Sponsor. File No. CD14-0230. Equal Housing Opportunity.